In order to provide the highest quality dentistry possible, you have to use the right tools, which is why Dr. Haren Patel makes sure that our office always has the latest and most state-of-the-art technology. With it, we’re able to find dental problems sooner, treat them faster, and keep patients more comfortable while we meet their needs. Sounds pretty nice, right? When you come to Dream Dental, you’ll only get the best of what modern-day dentistry has to offer. You can learn more by reading on below. We see nervous patients every day, and we’re able to help them glide through their appointments stress-free thanks to sedation dentistry. 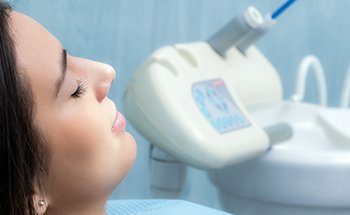 Using either oral conscious sedation (a pill) or nitrous oxide sedation, we’re able to allay fears and protect our patients from discomfort no matter what procedure they need. These techniques can work for patients of all ages to ensure they always enjoy relaxing appointments. Please let us know if you would be interested in using sedation! In the past, the only way a dentist could really look around in your mouth was by using either their naked eye or a small mirror, but thankfully, those days are now long gone! Using our intraoral camera, we can capture highly-detailed images of your teeth and gums and display them on a nearby monitor for you and your dentist to see. These images not only make it easier for our team to spot small issues, but they will also help you gain a much deeper understanding of your dental health and why you might need a particular treatment. 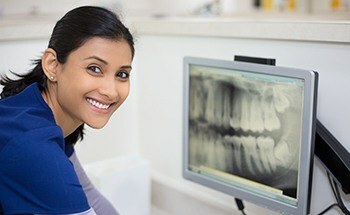 X-rays are used every day in dental offices around the world because they enable caregivers to get a better look at a patient’s teeth and catch problems before they are even visible to the naked eye. To make this tool even faster and safer, we’ve now gone fully digital. 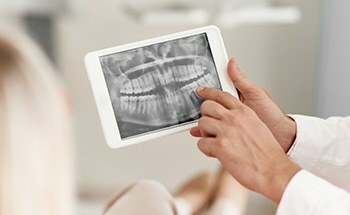 With digital X-rays, we can create crystal clear images almost instantly, plus they emit up to 80% LESS radiation compared to a traditional dental X-ray. Even better, we can even display and alter the images on a large chairside monitor so you can go over them with your dentist.